– Michael Phelps 8 GOLD Medals at Olympics 2008 Beijing. – Creates a Olympic record for more Gold Medals by an individual. – Breaks Mark Spitz Record. Phelps ties Mark Spitz with 7th Gold Medal at Olympics. (NECN) August 16, 2008 – It’s seven down and one to go for US swimmer Michael Phelps after a come from behind nail biter. You can just see the emotion in Phelps face after clinching his 7th Gold medal on Friday night in the 100 meter butterfly. He beat out Milorad Cavic of Serbia. Phelps now ties Mark Spitz record and hopes to swim into Olympic history on Saturday night with an eighth Gold medal in the 400 meter medley. On a local not, Maine’s Ian Crocker finished fourth. 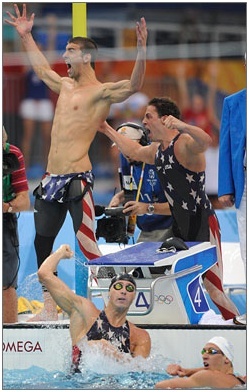 Michael Phelps, left, Garrett Weber-Gale and Jason Lezak (in water) rejoice after narrowly winning the men's 4x100 relay gold medal in Beijing on Monday morning. The title is back in American hands after losses at the last two Olympics. BEIJING ( August 11, 2008 ) …. The fastest French relay team ever assembled could not stop Michael Phelps’ assault on Olympic history. Instead, U.S. teammate Jason Lezak preserved it with the fastest relay split ever swum. Early today (Sunday night ET), Phelps, Lezak and their 4×100-meter freestyle relay teammates regained the Olympic title they owned from 1964 to 1996, in thrilling fashion and world-record time, keeping Phelps on track for a record eight gold medals. He now has two, with a chance at a third Tuesday morning (tonight ET) in the 200 freestyle. By the end of the Beijing Olympics, Phelps could surpass Mark Spitz’s record of seven golds set in the 1972 Olympics. If Phelps sets the record, a big thanks should go to Lezak, who caught France’s Alain Bernard in the last few meters of the race. The U.S. men won by eight-hundredths of a second, finishing in 3:08.24 to France’s 3:08.32. The winning time was nearly four seconds faster than the world record the U.S. men set in the preliminaries. Lezak swam his leg in 46.06 seconds. Bernard held the world record in the 100 freestyle at 47.5 seconds, but it was eclipsed by Australian Eamon Sullivan (47.24) in the opening leg of the relay. Besides individual events, world records may be set only in opening legs of a relay race. The 4×100 freestyle relay was one of the biggest question marks on Phelps’ program. A U.S. loss in the event in the 2004 Olympics derailed Phelps’ attempt at eight golds. Bernard predicted last week that the French would “smash” the Americans in the relay. Instead, the U.S. men put an emphatic point on Phelps’ run at the single greatest performance in Olympic history. “They had talked a lot about it, and we would just rather do it in the pool,” Lezak said.